(b. Los Angeles) lives and works in Los Angeles, USA. Castaño is a visual artist who obtained her B.F.A. in painting from the San Francisco Art Institute in 1995 and her M.F.A. from the UCLA School of Art and Architecture in 2001. Her work explores the aesthetic and social landscape of a hybrid Los Angeles through mixed-media paintings. In these works, Castaño re-mixes portraits of friends and acquaintances using figurative and abstract elements that echo the city’s colors, patterns, and textures. Shaggy hair, skinny pants, glitter and rhinestones mix readily with commercial textiles, beauty salon illustrations, and mercado storefront banners. Castaño lives in LA’s Historic Filipinotown district, and the area’s distinct mix of young artists and Latino, Filipino, and Korean families lies at the center of her work. Colorful signage, plastered posters and neon displays accent the area’s broad range of architectural styles, 70s modern and Spanish Deco converging with craftsman homes and mini-mall chic. The interplay between the neighborhood’s visual geography and the personal aesthetic choices of the people who inhabit it are re-imagined by Castaño in paintings that are simultaneously hard-edged abstraction, street tacky, and folk figurative. 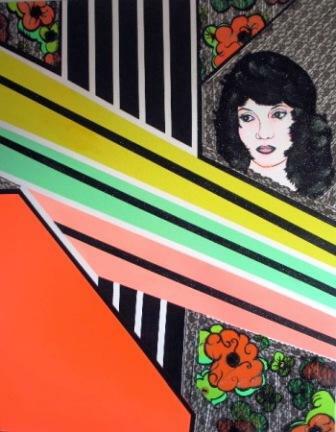 Castaño’s work will be featured in the upcoming LACMA exhibition, Phantom Sightings: Art After the Chicano Movement. She has exhibited widely throughout the United States, and has participated in shows such as the Pasadena Museum of California Art‘s Liquid Los Angeles: Contemporary Watercolor Painting, International Paper at Los Angeles’ Hammer Museum, The Public Art Fund New York’s Semi-Precious at the Brooklyn MetroTech Center, Three Great Walls at the Yerba Buena Center for the Arts, and Bay Area Now at the New Langton in San Francisco. Her European exhibitions have included LA Now: Emerging Artists at the Galerie Dominique Fiat in Paris, and Honey-Traps at London’s 38 Langham Street. She has also had solo exhibitions with Los Angeles’ Kontainer Gallery and Lombard-Freid in New York. In this interview from 2010 independent curator Tiffany Barber speaks to Castaño about her interest and family ties in the history of Colombia as well as Los Angeles’ synchretic cultural scene.